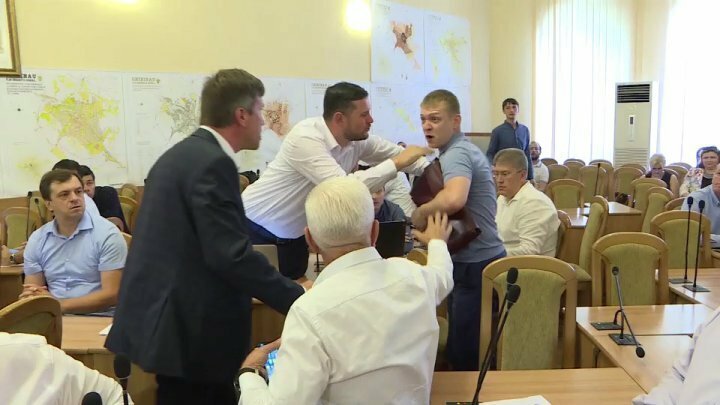 Embarrassed at the meeting of the Chisinau Municipal Council (CMC). The local non-affiliated elected Ion Ştefăniţă was pushed by activist Eugeniu Balţat. The scandal arose after the counselor had a heated exchange with PPEM colleague Ala Nemerenco. The activist defended him and reproached Stefaniţă as he shouted. The project that created the dispute provided for the radiation from the Monuments Registry of two buildings in the Center of the Capital. The request came from the owners. Ala Nemerenco was against, because, she said, they are part of the city's history. Ion Ştefănita, on the other hand, said that they pose danger, because they are on the brink. "As far as I understand, you are the Director of the Protection Agency and what's next there, the restoration of the monuments. You are irradiating a place on this list," said Ala Nemerenco, PPEM advisor. "If the façade falls, who will be responsible? The owner, of course, but also the municipality, how much money is allocated from the municipal budget for the financing and protection mechanism? ", Said Ion Ştefăniţă, non-affiliated advisor. Finally, all counselors voted against the project, and the activist left the meeting room.